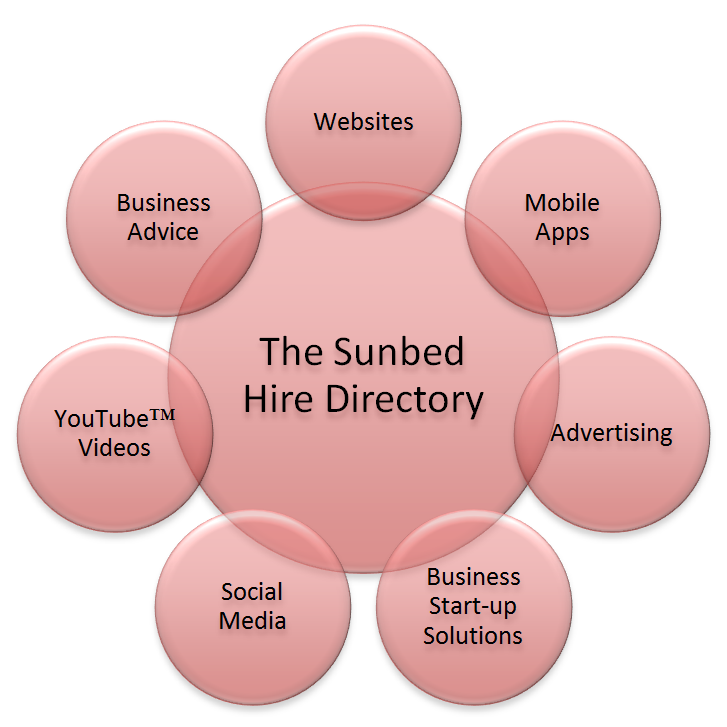 The Sunbed Hire Directory was established in 2003 in order to provide a cost effective way to help hire companies maximise their internet exposure. Many companies had relied on traditional methods of advertising, and failed to embrace the internet to their peril. Now, most modern companied have a website and enjoy the enhanced benefits offered by a featured advert with The Sunbed Hire Directory. We offer a choice of Advertising options, our most popular being the Platinum advert. In areas which have become crowded, you way wish to boost your presence with a Banner advert, which places you above your competitors. These banners are on a first come first served basis, so it's important to secure your priority areas as soon as possible. Web Site Development - We offer an affordable and craetive websites which act as a shop window for your business. The websites are attractive and will add value to your business. We have an excellent reputation for creating websites which develop an excellent presence on search engines such as Google. Please email us to find out more. Mobile Apps - These will be become increasingly essential. In 2003 when we started the directory, few had a website in the sunbed hire business. Well the same can be said in 2013 for Mobile Apps. Like websites, in the early days they are expensive, however here at The Sunbed Hire Directory we have a solution that is very affordable, and effective. The Apps can be added to your Advert with us, as well as downloaded from your website. They can be shared easily by you, your clients, via email or text or using medium such as Facebook and Twitter. Contact us to learn how we can make having an App affordable for your business. You Tube Videos - Google purchased You Tube and as a result it appears that now You Tube content is proving increasingly popular on Search Engine results. We can create affordable and simple videos which have the potential to feature on search engine results again for a very affordable price. These can also be promoted via your advert with us, or via social networking sites such as Facebook, and Twitter. Social Media - Facebook and Twitter are now part of everyday life for most people. You may not use it, but your customers increasingly do! We can create corporate designs to provide a professional look and feel to your social media. We can help you through the social media maze, and create the presence which may prove key to future success. Again, we can feature links from your advert to these social media sites. 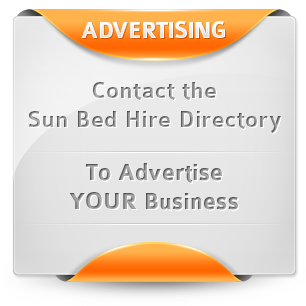 The Sunbed Hire Directory offers a fully integrated marketing solution. We are a resource which has managed to save many companies in the UK £1000's in advertising fees as a result of our service. Our prices are simple, with no tie in contracts, and simple monthly payments. If the solutions work, great, if they do not you cancel. This offers you reassurance unlike many companies who tie you in for 12 months. Having been in the Sunbed Business many years, we know what works and make it our business to keep our clients informed of new developments which may impact on the business. Please contact us using our Contact Page or email us at info@sunbedhire.co.uk and we will return your call. A Platinum listing gives you the best looking advert for your county. You'll always be at the top of the list (above silver and standard listings) and will be presented first to your customers. A Silver listing gives you an enhanced looking advert for your county. You'll always be above standard listings and will stand out more. Stand out from the crowd. This is ideal for the ambitious Sunbed hire Company, wholesalers or maybe other beauty providers such as Cosmetic Surgeons who see Sunbed users as their target market. Contact us today and we can tailor a package that suits your business needs. Your advertisement must be 468 pixels wide by 60 pixels high. It can be a jpg, gif or png format. If you would like an advertising banner and do not have the appropriate graphics available, we would be happy to create them for you for a small additional one-off charge.